Despite the uncertain economic environment globally, foreign direct investments in India surged 50 per cent to US $20.76 billion from January-August, according to the industry ministry's latest data. During January-August 2010 the country attracted FDI worth $13.85 billion. Shares logged their biggest weekly gain in nearly two months on Friday, bolstered by gains in financials as hopes of an end to the monetary policy tightening cycle in Asia's third-largest economy drew investors back into beaten down stocks. State-owned Oil & Natural Gas Corp (ONGC) plans to take up to 49 per cent stake in one of the five proposed nuclear power plants of Nuclear Power Corp of India Ltd (NPCIL). The Formula 1 Grand Prix race in India could generate revenues of over Rs 90,000 crore in the next 10 years and create 15 lakh new job opportunities for technical workers, industry body Assocham said Friday. Software giant Microsoft has topped a list of the world's best multinational companies to work for, where all the top ten positions have been bagged by American firms. Samsung Electronics Co surpassed Apple Inc as the world's top smartphone maker with more than 40% shipment growth, and forecast strong sales in the fourth quarter, as it aims to consolidate its lead against rivals. Research In Motion has set up a facility in Mumbai to help the government carry out lawful surveillance of its BlackBerry services, the Wall Street Journal said, citing people familiar with the matter. Nigerian telecom regulator Nigerian Communications Commission (NCC) has threatened to fine an Indian firm’s subsidiary, Airtel Nigeria, and two other companies if they fail to improve the quality of their mobile services and prevent them from registering new subscribers. Gold regained the Rs 28,000 per 10 grams mark after a month by adding Rs 110 today, on brisk buying by stockists driven by firming global trend. Silver prices also surged by Rs 2,300 to Rs 58,300 per kg on increased offtake by industrial units and speculators. Maruti Suzuki is feeling the pinch of labour strikes, with about 2 to 4 per cent of the prospective customers of one of its successful models, Swift, deciding to cancel orders due to the long waiting period. Indian Hotels Co on Friday reported a profit after tax of Rs. 8.12 crore for the second quarter ended September 30, 2011, over the same period previous fiscal. The company had posted a net loss of Rs. 6.30 crore in the same period last financial year, Indian Hotels said in a filing to the BSE. Experts maintain the government should further streamline policies and make the environment more conducive to FDI. The sectors that attracted maximum FDI during the first eight months this year include services (financial and nonfinancial), telecom, housing and real estate, construction and power, the industry ministry data showed. Mauritius, Singapore, the United States, the United Kingdom, the Netherlands, Japan, Germany and the United Arab Emirates, among other countries, are the major investors in India. FDI inflows into India totalled $19.42 billion in fiscal 2010-11, down from $25.83 billion in 2009-10. Recently, the government further liberalized the FDI regime, allowing overseas investment in beekeeping and share pledging for raising external debt. The gains in the domestic market were also underpinned by a rally in global stocks, which headed for their best week in over two years following EU leaders' efforts to contain the euro zone debt crisis. Shares in ICICI Bank, the country's no. 2 lender, led the gains, rising 7.1 percent to 933.35 rupees ($18.85), as hopes of a pause in interest rate hikes boosted credit growth outlook. Still, the stock is down 18.5 percent so far this year. The bank is also expected to report nearly 16 percent rise in its fiscal second-quarter profit on Monday. 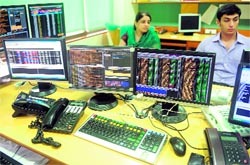 The main 30-share Bombay Stock Exchange index ended up 2.98% at 17,804.80 points, after having risen as much as 3.6 percent in early deals to its highest level since Aug. 4, with all but three of the index components closing in the positive territory. The benchmark, which is down 13.2% in 2011, surged 6.1% in this holiday truncated week, its best weekly percentage gain since the week ended Sept. 2. The market was closed on Thursday after a brief special session on Wednesday. "Interest rate hikes were a big overhang on the market and the investors were concerned about its impact on the corporate profitability," said Dipen Shah, head of research for private client group at Kotak Securities. "The fact that the central bank has said there could be a pause now has come as a big relief to the market," he said. "We’re in discussions with NPCIL for incorporating a joint venture for setting up a nuclear power plant. NPCIL will have a minimum of 51 per cent stake in the joint venture while ONGC would have a maximum of 49 per cent," a company official said. The joint venture would build, own and operate nuclear power plants for energy generation at mutually agreed locations. It would be managed by a Board of Directors made up of nominees from both the companies. The company’s chairman will be from the directors nominated by NPCIL. NPCIL intends to set up five 'nuclear energy parks' each with a total capacity of up to 10,000 MW at a single location. The sites identified for these energy parks are Kudankulam in Tamil Nadu, Jaitapur in Maharashtra, Mithi Virdi in Gujarat, Kowada in Andhra Pradesh and Haripur in West Bengal with imported reactors. Besides this, 700 MW indigenous PHWR (pressurized heavy water reactor) technology is planned for Kumharia in Haryana (2800 MW), Bargi in Madhya Pradesh (1400 MW) and Markandi in Orissa (6000 MW). "Some of the sites are under review in view of the local resistance to such projects. We are yet to freeze a location for the power plant," the official said. Nuclear power being highly capital intensive sector, requires about Rs 10 crore per megawatt (MW) and projects are generally financed in 70:30 debt-equity ratio. For a 2000 MW project, ONGC's equity would come to Rs 2,940 crore spread over 5-6 years. "With guarantee of fuel supply and proven technology, nuclear power will be India's option for mitigating the twin problems of depleting oil resources world over with high oil prices and Green-House-Gas emissions from fossil fuels. "In contrast to wind or solar energy, the land footprint of nuclear plant is very small," the official said. Internet giant Google has been ranked at the fourth place in the list of compiled by human resources consultancy Great Place to Work Institute. Microsoft is followed by software developer SAS and network storage provider NetApp at the second and third ranks, respectively, while logistics major FedEx is ranked fifth on the list of “25 best MNC workplaces”. While there are no Asian companies on the list, all the top ten positions have been bagged by the US firms. Also, 18 out of the total 25 firms on the list are from the world's biggest economy. The inaugural rankings were based on opinion surveys of more than 2.5 million employees across the world about their workplace culture. RIM gave India access to its consumer services, including its Messenger services, in January this year after authorities raised security concerns, but said it could not allow monitoring of its enterprise email. Research In Motion partly assuaged India by setting up the small Mumbai facility earlier this year to handle surveillance requests from India, the Wall Street Journal reported. India can submit the name of a suspect its investigators want to wiretap, and RIM will return decoded messages for that individual, as long as it is satisfied the request has legal authorization, it said. RIM was not available for comment outside regular Canadian business hours. The new facility will handle lawful intercept requests for consumer services including the BlackBerry Messenger chat service, the paper said. India saw the move as a positive step, but would prefer an arrangement where it has the ability to decode messages itself, so that it can conduct surveillance without disclosing the names of suspects to RIM, the Journal reported. Airtel Nigeria, a subsidiary of Bharti Airtel, South Africa’s MTN and locally owned Globacom would pay a fine of $6,216 per subscriber if the sanctions take effect, the NCC said here in a bid to improve quality of telephone service in the oil rich country. According to NCC, it has procured equipment to monitor if customers are able to make and receive calls as well as the quality of the calls. The directive followed customer complaints of poor services by some telecom companies. NCC spokesman Reuben Muoka said the Commission has given the operators 30 days to improve their service quality or face sanctions. “This follows a dismal performance by the three operators on quality of service from the result of an independent monitoring exercise carried out by the Commission across the country.” Muoka said. Meanwhile, Airtel Nigeria’s managing director (MD) and chief executive officer (CEO) Rajan Swaroop had earlier urged the government to issue a National Policy on Communications (NPC). At the 3rd West African Information and Communications Technology (WAFICT) event, he urged the policy makers to incorporate broadband in the framework of their strategies. Swaroop’s comments and the regulator’s warning came amid some experts saying that the quality issues can be liked to under-utilization of landline network. A telecom expert Monday Ogbe told a local newspaper that the poor services could be linked to poor fibre-utilization. Ogbe said there is over-dependence on mobile technology to the detriment of fixed lines - a situation that has led to congestion and poor quality, adding that in Nigeria most of the calls are routed through mobile phones unlike in other countries. Trading sentiment turned bullish as gold rallied in global markets as European leaders agreed on a plan to contain the region's debt crisis. Gold prices in global markets gained 0.5% to US $1,752.82 an ounce, the highest level since September 23. In addition, pickup in demand driven by the festive season was another factor behind the rise in gold prices, traders said. Alarmingly for the firm, dealers said, is the fact that around half the customers who cancelled orders have opted for rival brands such as Toyota Liva and Volkswagen Polo. The new model of Swift, one of the top selling cars from Maruti Suzuki India, was launched in August. The firm has about 100,000 undelivered booking orders of Swift. Depending on petrol and diesel options, and geographical locations, buyers are waiting for 2-7 months to own a Swift.